Properties in Hawks Falls average 4.7 out of 5 stars. Property 2: The Outdoors Are Calling so Stay At The Acorn Cottage! Property 5: Albrightsville Cabin w/Hot Tub - 10 Min to Slopes! Property 7: Bucks Cozy Cabin Adventure! Property 8: Secluded Mtn Cabin w/Deck - Walk to Lake Harmony! 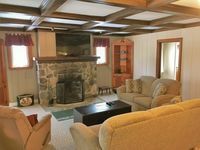 Property 12: Pocono Lake Cabin w/Heated Pool Access! Property 13: Cabin w/ Fire Pit & Decks - Walk to Lake Harmony! Property 14: Cozy Cottage Life. Private Lot. Free Wifi. Walk to pool, beach, and playground. Property 18: Rustic Cabin Lake Home~Ski slopes nearby ~ WIFI~ pets welcome~ GREAT REVIEWS! Property 19: Book Your Summer Escape without a Cleaning Fee! Property 25: Get cozy at Big Al's Poconos Creek House - Wireless DSL & Trout!! Property 28: Lakefront Cabin w/ Private Beach, Dock, AC, 4 Boats, Sauna, Dog Friendly!!! Property 30: Adorable Cozy Log Cabin - Check out our Spring Special!!! Property 32: 4 bedroom, 2 bath rustic cabin right in the HEART of Split Rock. Property 34: Looking For Some Beautiful Views?? Property 35: Cozy Pocono Lake Cabin in Gated Community w/Pools! 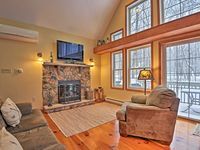 Property 37: Cozy Pocono Getaway Close to Jack Frost and Big Boulder! Property 40: LAKEFRONT Cabin on a 22+ acres wooded lot. Close to BLUE MOUNTAIN Ski Resort! Property 41: Beautiful Cabin in The Poconos on The Lehigh River! Property 43: Charming Arrowhead Lake Cottage - Walk to Beach! Property 44: Make our beautiful lakefront property your magical home away from home!